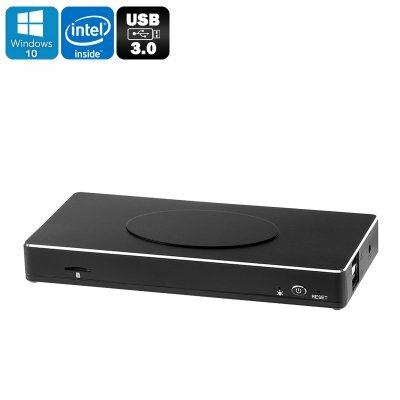 Successfully Added Mini PC APL100 Vbox - Windows 10, Apollo Lake CPU, 4GB RAM, 256GB SATA Support, USB 3.0, Type C, Wi-Fi to your Shopping Cart. The APL100 Vbox is a palm-sized mini-PC and one of the smallest fully fledged computers on the market. A cool sleek design means this mini PC isn't much bigger than your smartphone, however, don't let size fool you as beneath that lush exterior is some terrific hardware. Coming with a Windows 10 operating system preinstalled you'll have the best productivity software at your fingertips. Rocking an Intel Apollo Lake N3455 processor, clocked at 2.2GHz, and with 4GB of RAM, the APL100 Vbox is well equipped for some serious computing. It offers a desktop like performance and thanks to the Gen 9 GPU can handle games and movies respectably as well as graphic intensive software and multitasking. The APL Vbox is equipped with everything you need for a Windows media center and is suitable for both home and office use. By supporting a staggering 265GB of storage on a mini SATA drive, you will have enough space to keep all your important files, favorite movies and music library with plenty left over for a host of games. You can also add extra storage with the micro SD card slot or a memory pen in the fast USB ports. This windows 10 PC has wireless connectivity and the 802.11 ac protocol is a welcome addition that means faster download speeds when not connected with a LAN cable. There are two USB 2.0, one USB 3.0 and a USB type C port so you'll have plenty of options for peripherals, such as Cameras, games controllers or memory pens. The Vbox APL100 mini PC comes with 12 months warranty, brought to you by the leader in electronic devices as well as wholesale Windows 10 computers and media players..
As a wholesaler, we provide no software support, advice, or training regarding the Windows 10 operating system and software. Does not run hot when playing FullHD videos. A nerving permanently running hiss from the mini fan on the meainboard. But to my surprise "normal activities like updates file copy, web browsing do not run the CPU temperature higher than 70 degrees Celsius even after I removed the fan. The big copper heat spreader on the mainaboard seems to be efficient enough. It only gets handwarm on the outside and is dead silent! First i must say i wasn't sure about buying from out of my country BUT i will tell you the seller was so fast getting me my product i was beyond pleased when i received my item in five days. I had the option for UPS Air for $25.00 and the seller had it ready for the pickup the same day. (Very Impressed) Now the computer, WOW this thing is fast, has both wireless and lan connections, USB 2.0 and USB 3.0, HDMI, came with power adapter, HDMI cable and great packaging. Windows 10 home is pre installed but i upgraded to windows 10 pro. I did back up the system and drivers however they were not needed for the new install. You can look on line for a company SCDKEY and buy windows 10 pro for about $20.00 or less. I did install a 128GB M SATA very easy as the case has a door built into the bottom for easy access. Take care to order the proper M SAT drive as there are many types of M SAT Just look at how it is keyed. You can search M SAT types to get the right one. I use this as a media center but it has enough power to run as a full desktop. Just Very Cool and very happy with product and the FAST shipping.